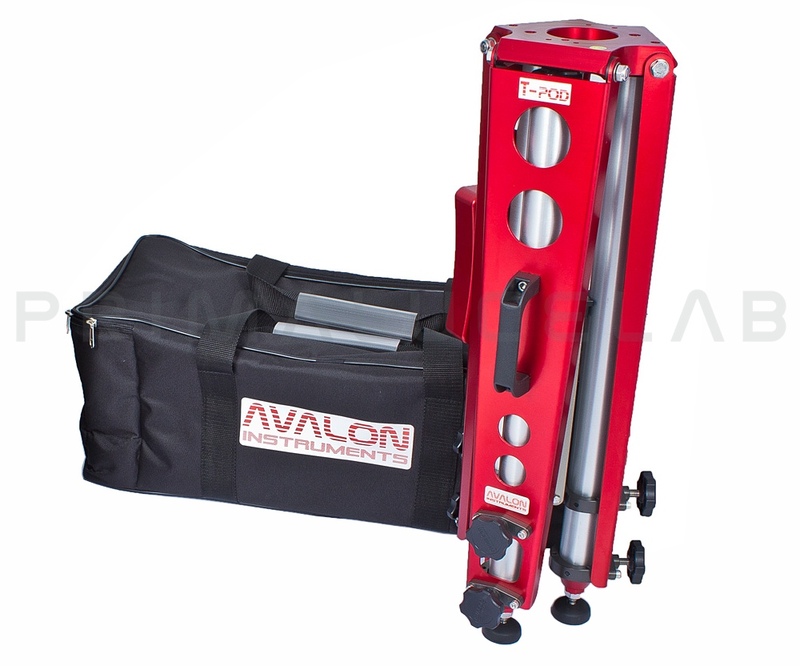 Avalon Instruments T-POD tripods have been designed to revolutionize the world of portable astronomy with both the style and function that Avalon Instruments is known for. Made entirely from anodized aluminum with stainless steel hardware, the low weight and high stability of these tripods make them the ideal companion for travelling observers and astrophotographers. The new Avalon T-Pods are available in three sizes and capacity, the T-90 with a 132 pound (60 Kg) capacity, the T-110, T-130 with a 220 pound (100 Kg) loading capacity. The built-in spreader system allows the tripod to be quickly and easily opened with no loose parts while the double leg locks and included bubble level make it easy to level the tripod and securely lock it in place. The base of the legs can be fitted with ground spikes for soft ground or rubber tips for hard surfaces. In addition, the tripods are equipped with a convenient handle for easy transport. The T-110 weighs only 15.50 pounds (6.9 Kg) and collapses to just 30 inches (75cm) while extending to a maximum height of 43 inches (110cm).